Popped open a cold “Hacker-Pschorr Munchner Hell” last night. YUM! It was fabulous! Helles beers are a Pilsner-like class, so if you like the lightness of a Pilsner, you should give Hell a try! Guten Appetit, Bottoms Up, and see you at confession in a few days! Awesome. In Norway you can actually go to Hell……! 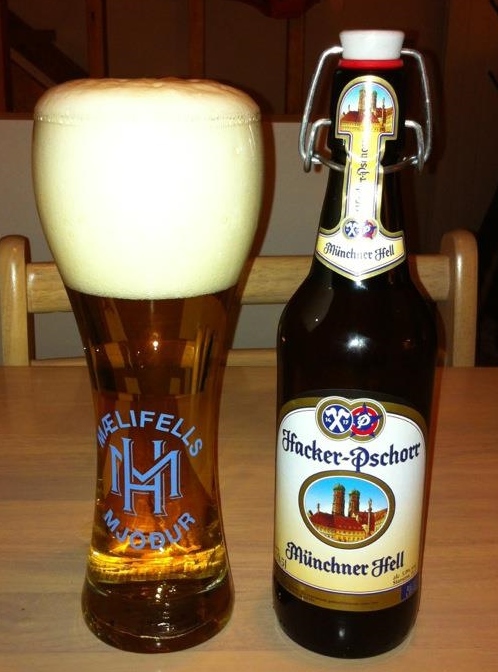 Love a glass of helles – it’s the best!! It is great, isn’t it?! I really like some of the dark beers here, but they are so heavy that I can really only drink a few sips. This, on the other hand, I could absolutely swim in! I’d love to try it, I’m a fan of a good Pilsner for sure. I hear you! This has maybe a little less “bitter” than a pils– but check it out and let me know what you think.